Groupon (NASDAQ:GRPN ) announced they have renewed the lease for its Groupon Goods fulfillment center located in Hebron, Kentucky. The new lease extends for five years until 2023. The 330,000-square-foot building is the center of Groupon’s direct North America Goods business. Since 2013 Groupon has shipped in excess of more than 20 million units to their customers in the United States and Canada regions. 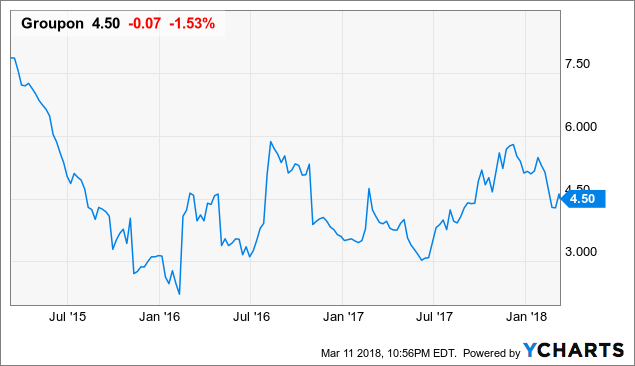 Zacks Investment Research raised Groupon from a “sell” rating to a “hold” rating in a research report on Thursday, February 22nd. Piper Jaffray Companies reiterated an “overweight” rating and set a $6.25 price target on shares of Groupon in a research report on Tuesday, December 12th. Groupon (NASDAQ:GRPN) is the most popular daily deals website across America and worldwide. Offering amazing deals on everything from dining out, to consumer goods and travel deals. They have a loyal customer base of 32.7M in 2017 which grew by 200,000. The adjusted EBITDA for Q4’17 attained $105.3M vs $80.2M Y/Y, a new record for the company. Groupon has concentrated on maximizing gross profit and a line- up of offerings that offer a higher margin. The continuing effort by the company to maximize gross profit, making a shift towards higher margin offerings, and intensifying up on the local goods and services market. Coupons have razor thin margins, hence the reason for the shift to local service businesses which will reap higher margins for Groupon going forward. Collective buying power is has certainly is a winning success in today’s competitive landscape for retail goods and services. Consumers have proven that they are loyal to Groupon and its business model. Follow the Money- According to NASDAQ there are 137 Increased Institutional Holders and 68,770,170 Increased Total Shares Held. The top five institutional holders of the stock are, VANGUARD GROUP INC, BLACROCK GROUP, JERICHO CAPITAL ASSET MANAGEMENT L.P, TIAA CREF INVESTMENT MANAGEMENT LLC, AND STATE STREET CORP.
Groupon’s annual revenue was 2.84 billion US dollars in 2018 with about 50 million active customers in the fourth quarter of 2017. CWEB Analyst’s have initiated a Buy Rating for Groupon (NASDAQ:GRPN) and a Price Target of $10-$20 within 12 months.